Author: Robert E. LeBlanc, M.D. Editorial Board Member: Hillary Rose Elwood, M.D. Cite this page: LeBlanc RE. 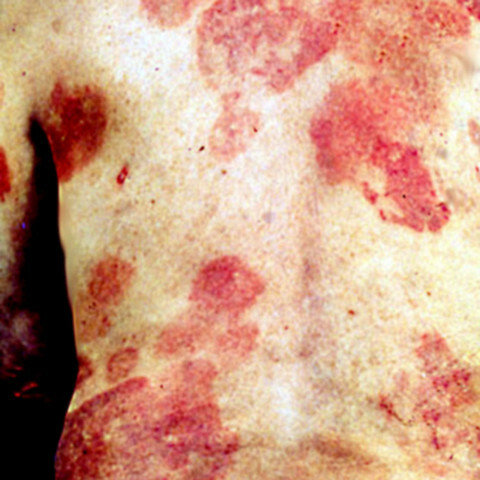 Mycosis fungoides (MF). PathologyOutlines.com website. 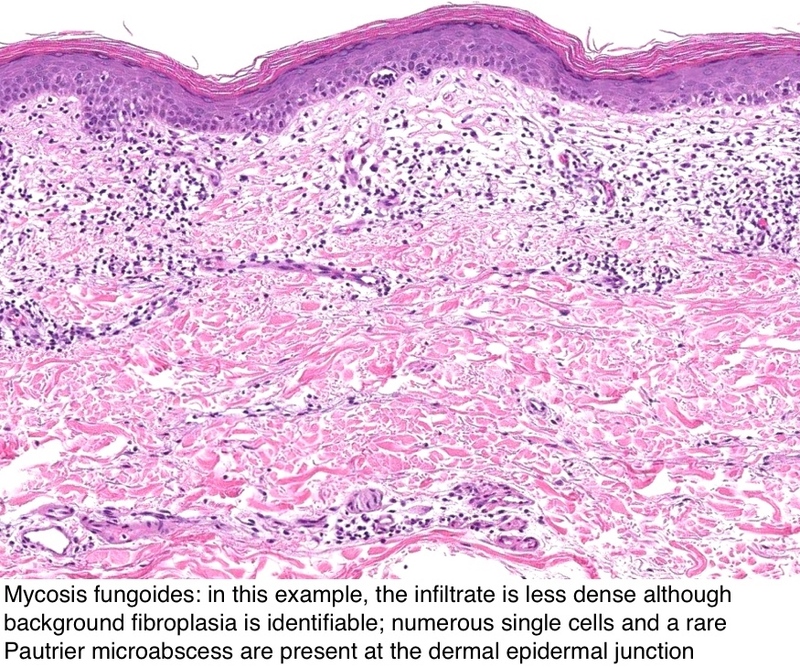 http://www.pathologyoutlines.com/topic/skintumornonmelanocyticmycosisfungoides.html. Accessed April 25th, 2019. Contributed by Mark R. Wick, M.D. Contributed by Robert E. LeBlanc, M.D. Which of the following studies best distinguishes mycosis fungoides from adult T cell leukemia / lymphoma? 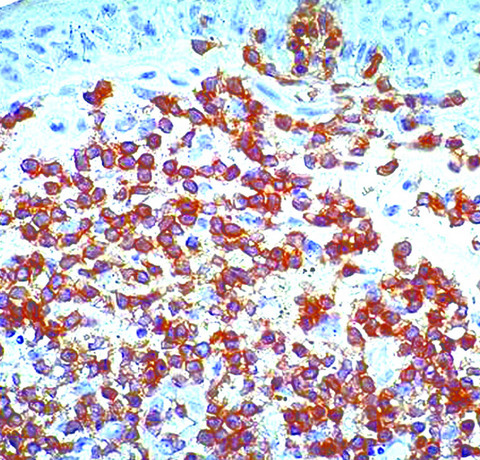 C. HTLV1 serology. 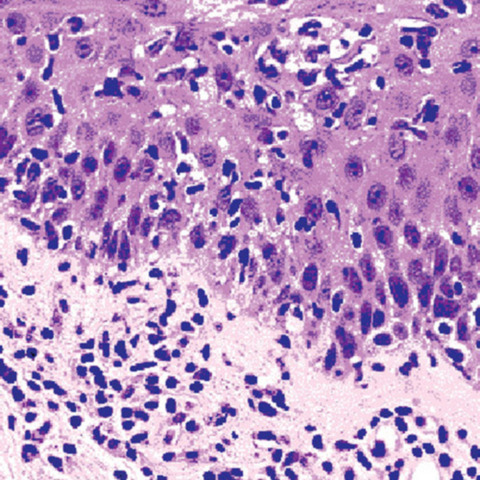 A clinical history, positive HTLV1 serology and a subsequent clinical staging could potentially distinguish mycosis fungoides from adult T cell leukemia / lymphoma. 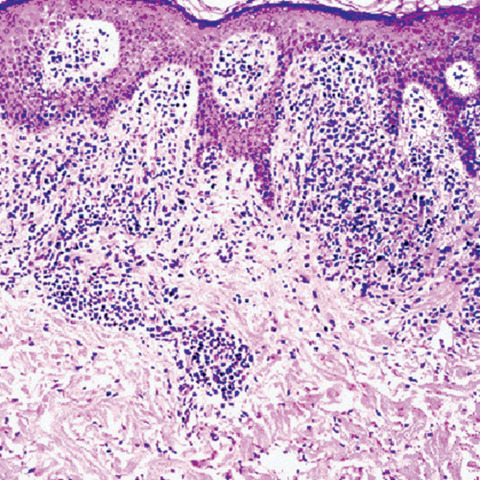 These diseases can show significant clinical and histologic overlap. 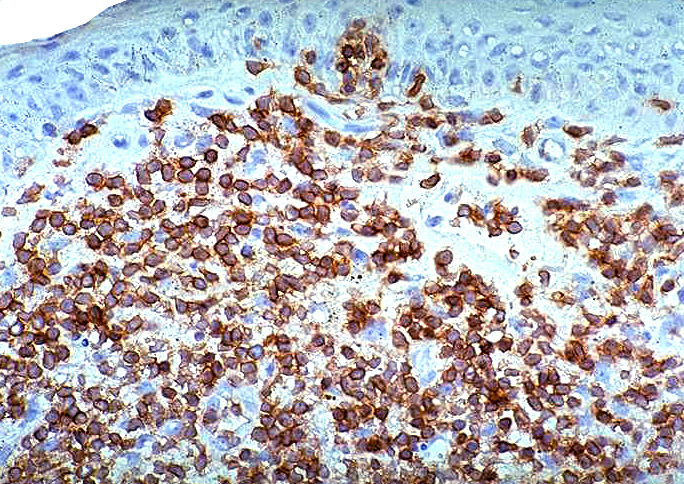 Both can show CD25 expression. 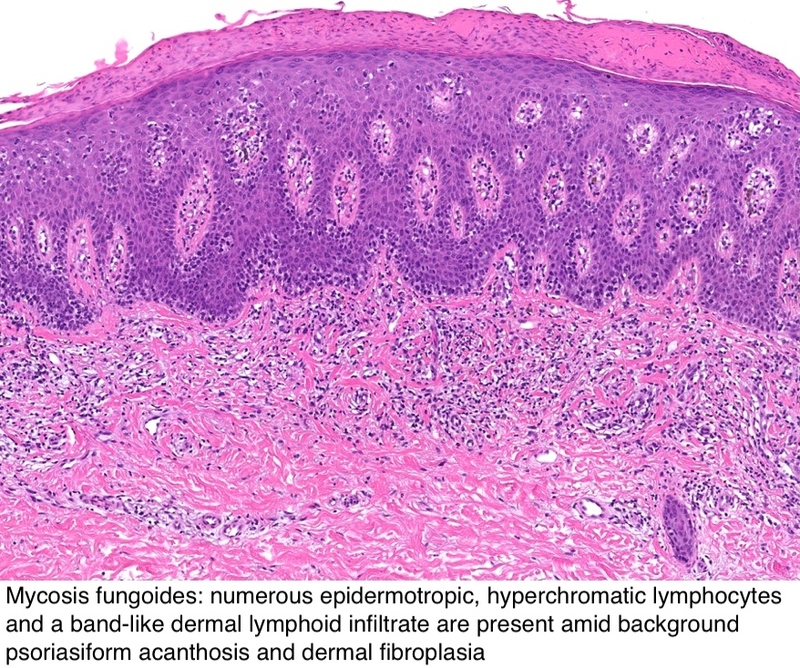 Which of the following findings best distinguishes mycosis fungoides from Sézary syndrome? A. History of cutaneous patches at disease onset. 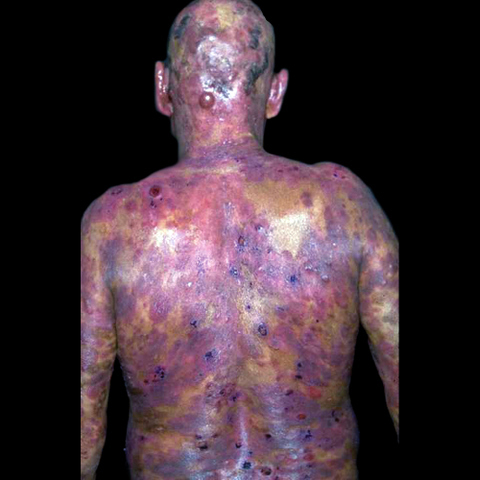 The history of patch stage disease preceding the erythroderma distinguishes mycosis fungoides from Sézary syndrome. 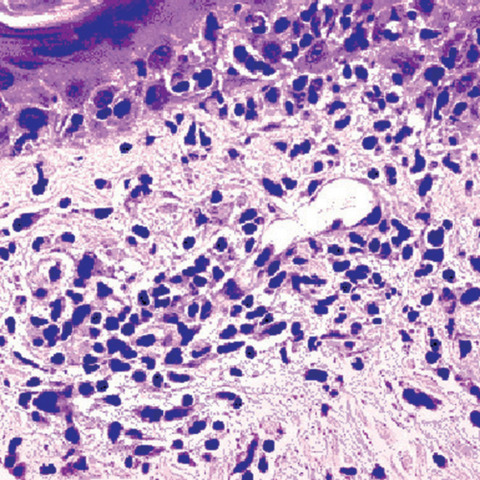 The remaining options can be seen with both diseases, although involvement of the bone marrow is rare.